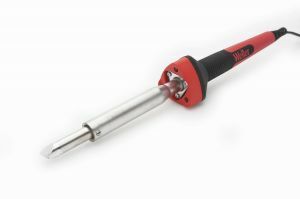 High-Performance LED Soldering Iron - 80 Watts, up to 900-Degree F.
Three 5mm high temperature long-life LEDs at 25 Lumens/ft² for superior soldering accuracy and application illumination. Co-molded soft grip ribbed handle design for maximum comfort and reduced slipage. Triangular area for maximum of tip control. Round handle for ease of tip rotation. Package Includes: Iron with MT620, 10mm tip, iron stand, user manual.